. When I describe the First Horns as "dynamically accurate," I don't mean they merely play very loud or very soft; instead, they captured all the volume gradations in between and rapidly react to tiny volume changes, which in my view is a major component of musical reproduction." "The midrange was smooth and natural-sounding, perhaps even a smidgen laid-back," and "as I have come to expect from a single-driver system, the First Horns cast a well-defined soundstage." Features "Like many horn-loaded speakers on the market today, the First Horns only use a single driver -- a Fostex FE126E, whose 4" cone covers the entire frequency range. That means there is no crossover, which avoids losses and distortions inherent in crossover filters." "The 40-pound cabinet, which slants backward from its base, is constructed of eleven-ply Baltic Birch plywood, a dense and inert material that, unlike the ubiquitous MDF used for many speaker cabinets, looks pretty attractive in its naked form."
. A raw-sounding lower treble peak smoothed out considerably during the break-in period, and improved even more over the next several hundred hours." Value "Ultimately, what the First Horns give you is bargain-basement entry into the world of horns and single-driver speakers." Why do people buy horn-loaded loudspeakers? They are often large, have poor bass extension, and have distinct colorations. Their enclosures are often ungainly -- even grotesque. The complexity and size of the enclosures often make horn speakers expensive too. In their favor, horns are usually very sensitive, allowing the use of low-powered amps. They often sound very fast, very coherent, and very dynamic. Thus, like most choices in high-end audio (and life), horn speakers embody compromises; the listener picks the ones that provide the least subjective listening obstacles. I ventured into the horn world after I discovered the attraction of single-ended-triode amplifiers, and I had to find some speakers sensitive enough to perform well with them. My first SET amps, Wright Sound Company WPA3.5 monoblocks, produced all of 3 1/2 watts from their 2A3 tubes. That meant high-sensitivity speakers were essential. In return, I got a beautiful midrange and a very palpable soundstage that gave the illusion the performers were in the room with me -- heady stuff. Voices in particular were realistic and delicately nuanced. Bass and treble werent bad either. Atelier has taken a unique approach with its First Horn loudspeaker, one that addresses both the drawbacks and merits of horn-loaded speakers. The First Horns are inexpensive -- a mere $699 USD per pair -- and sold direct from the Canadian manufacturer. Their bass goes down to only 70Hz, while their high frequencies extend to 18kHz and that's it. Like many horn-loaded speakers on the market today, the First Horns only use a single driver -- a Fostex FE126E, whose 4" paper cone covers the entire frequency range. That means there is no crossover, so no losses and distortions inherent in crossover filters. All parts of the frequency spectrum are reproduced by the same driver, so everything is cut from the same cloth (or in this case, the same paper). Totally avoided are the difficulties speaker designers face in integrating fast tweeters with slower midranges and woofers. That also means all parts of the frequency spectrum are reproduced in phase, which theoretically should improve coherency and transparency. The First Horn has a small 36"H x 7 1/2"W x 15"D enclosure. The 40-pound cabinet, which slants backward from its base, is constructed of eleven-ply Baltic Birch plywood, a dense and inert material that, unlike the ubiquitous MDF used for many speaker cabinets, looks pretty attractive in its naked form. Cabinet corners are curved to minimize diffraction, and the cabinet is finished with a clear lacquer that lets the natural light-colored plywood shine through. The mouth of the back-loaded horn vents in the rear of the cabinet, and is about 16 1/2" tall. A stainless-steel damping ring encircles the white-coned driver. Heavy and impeccably finished, it looks like something youd find on much more expensive speakers. There is no grille. The combination of the light birch wood, the white driver cone, and the stainless-steel damping ring looked quite elegant to me. Several visitors commented favorably on the speakers appearance, often using the word "cute." They are definitely not grotesque. Sturdy Cardas binding posts on the rear of the enclosures secure the speaker cables. They accept 1/4" spade lugs, banana plugs, or bare wire. And since they are all metal, its easy to use a socket wrench or Postman to screw the posts down tightly onto spade lugs. The First Horns are wired internally with 14-gauge oxygen-free copper wire. The First Horn is rated at 95dB sensitivity, with a maximum power handling of 45 watts and minimum required power of 3 watts. As mentioned earlier, frequency response is specified as 70Hz-18kHz, no +/- variation given. A matching B9 bass module is listed on the Atelier website, but Jean-Pierre Boudreau, co-founder of Atelier, informed me that its production has been suspended due to supplier problems. Jean-Pierre also told me that the First Horns required only 80 to 90 hours of break-in to achieve 80% of their maximum capabilities, so I inserted them in a break-in system and ran them for over 200 hours, figuring that should get them pretty close to their final capabilities. A raw-sounding lower treble peak smoothed out considerably during the break-in period and improved even more over the next several hundred hours. Although the First Horns Cardas connectors work with virtually any speaker cable, it seemed goofy to use $2000 cables with $699 speakers, so I used some of the lower-priced cables in my collection. Thus, most of my listening was done with Blue Marble Audios $795 speaker cable, a neutral-sounding cable that has sounded good with a variety of speakers. Another speaker cable with BFA-style banana plugs didnt make reliable electrical contact with the binding posts. The First Horns arent too finicky about where you locate them. Boudreau told me he placed the speakers 29" from the wall behind them, but I found that placing them 24" from the wall provided some welcome bass reinforcement. Unlike with a ported enclosure, where the air from a port exits under high pressure, air exits the mouth of a horn speaker traveling at lower pressure, so a horn isnt as fussy about placement as a rear-ported enclosure. Still, you dont want to jam it up against the wall. I pointed the horns directly at my listening position; after all, a 4" tweeter is very directional at higher frequencies. The cabinet rests on three stainless-steel spikes, the two in front mounted on a very heavy stainless-steel outrigger that is a little over 13" wide. This outrigger provides much-needed stability for the narrow cabinet. The third spike screws into the bottom of the cabinet toward the rear, forming a tripod base that wont rock back and forth on uneven floors. The front spikes were not long and sharp enough to penetrate my carpet and make contact with the concrete slab, so the speakers werent as stable as they would be on wood or tile floors. I tried the speakers with an assortment of amplifiers. Boudreau encouraged me to use both tube and solid-state amps. Since he expressed a fondness for single-ended triode amplifiers that use the 2A3 tube, I began by connecting my Wright Sound Company WPA3.5 monoblocks to the First Horns. Although the $1460 WPA3.5 amps work fine with my 102dB sensitivity Second ReTHM speakers, they imposed some volume limitations on the First Horns in my listening room. Still, at moderate volume levels, the WPA3.5s produced their characteristic open, pure sound. In a smaller room, they could provide all the power youd need. My 6Wpc Art Audio PX 25 amp, another SET design, drove the First Horns to higher levels and sounded quite good; however, at $7500, it probably wouldnt be matched with the First Horns. A more reasonably priced partner for the First Horns was the Welborne Labs DRD 300B monoblock amplifiers. Rated at 7 watts per monoblock, the $1635 (kit price) Welborne amps had no trouble driving the First Horns as loud as I cared to listen. The Welbornes smooth 300B tubes really complemented the First Horns midrange and treble. It was hard to choose between the Welbornes and the PX 25, but because Im more familiar with its sound, I used the PX 25 for most of my listening evaluations. The First Horns had a lively, dynamically accurate sound that conveyed the excitement of music. Handling both microdynamics and macrodynamics with aplomb, the speakers played loud without any sign of distress, even with the low-power amps I used. When I describe the First Horns as "dynamically accurate," I don't mean they merely play very loud or very soft; instead, they capture all the volume gradations in between and rapidly react to tiny volume changes, which, in my view, is a major component of musical reproduction. Power amplifiers  Art Audio PX 25 stereo amp, Wright Sound Company WPA3.5 monoblocks, Welborne Labs DRD 300B monoblocks. Preamplifier  deHavilland Mercury 2. Analog  Linn LP-12 turntable, Graham 2.2 tonearm, Dynavector DRT XV-1 cartridge, Audio Research PH5 phono stage. Interconnects  Crystal Cable CrystalConnect Piccolo, Purist Audio Design Venustas. Speaker cables  Crystal Cable CrystalSpeak Micro, Purist Audio Design Venustas, Blue Marble Audio speaker cables. Power cords  Purist Audio Design Venustas, Blue Marble Audio Lightning. The midrange was smooth and natural-sounding, perhaps even a smidgen laid-back. Single-driver speakers have a reputation for handling voices well, and the First Horns completely lived up to that reputation. On the CD Roadhouses & Automobiles [Stockfisch SFT 357.6027.2], Chris Joness robust baritone was detailed and expressive, and his guitar was very well reproduced. Occasionally, it was obvious that some of the low notes of the bass guitar were not fully reproduced, though. Eva Cassidys LP Songbird [S&P Records S&P-501] was smooth and refined, but lacking some of the upper-midrange bite noted through some other speakers. On Songs of the Auvergne [Analogue Productions APC 002], Netania Davraths voice was up front, with a touch of sibilance. The "little-girl" character of her voice that adds charm to these folk-based songs came through clearly. I did observe a slight veiling in the midrange, as if there was a bit of a depression in the frequency response there, but this didn't hinder instrumental timbres, which sounded realistic. Instruments sounded natural, exhibiting the complete array of overtones. 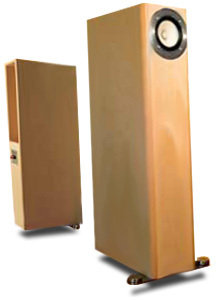 These days, speakers are often rated to deliver treble into the stratosphere, yet the First Horns are rated to a mere 18kHz and likely with some amount of attenuation. Still, their highs were strong, perhaps even slightly peaky. Triangles and cymbals stood out a little from the mix. LP noise, on the other hand, was not at all emphasized; if anything, it was slightly suppressed, which will be welcome news to collectors of used LPs. As I have come to expect from a single-driver system, the First Horns cast a well-defined soundstage. Images were solid and located in space between the speakers. The First Horns definitely produced the palpable image for which single-driver speakers are legendary. On An Evening at the Medicis (Festival Music of Florence) [MCA Classics LP MCA-25953], the performers were precisely placed in the spacious environment with plenty of air around them. Drums sounded surprisingly extended and powerful. The First Horns arent the speakers of choice for organ music, but you wouldnt expect them to be. Their bass is surprisingly robust for speakers with 4" full-range drivers, but size matters, so the last two octaves of bass are missing. The First Horns low end rolled off gradually, with no artificially boosted bass peak trying to create an impression of extended bass. With music that doesnt have much bass, the First Horns sounded surprisingly full. I love listening to music of the Renaissance period, which usually doesnt have deep bass; the First Horns reproduced such recordings very comfortably and completely. One positive byproduct of this gentle low-frequency roll-off was that it made integrating the First Horns with a subwoofer, in my case a $299 Infinity PS-8, rather easy. Based on my experience trying to integrate subwoofers with my ReTHM speakers, I have formed a working theory that if a subwoofer is going to integrate well with a main speaker, it wont take a lot of work. All the subs Ive used either worked or they didnt. The PS-8 supported my theory. There were a lot of tiny adjustments required to get an optimum blend between the sub and the horns, but basic compatibility was not difficult to achieve. Atelier is developing a horn subwoofer named The Beast that is said to work extremely well with the First Horns, but it will be priced considerably higher than the speakers. Still, the Infinity sub added musical value to the sound. Ive already described my Second ReTHM speakers ($7500 per pair) to some extent in other reviews. They are tall, narrow speakers that use a highly modified 8" Lowther DX4 driver rear-loaded in an elaborate horn enclosure. In spite of that, their bass response is definitely limited. The DX4 driver sounds incredibly fast and detailed, although its somewhat forward-sounding as well. Thanks to the ReTHMs narrow, rounded enclosures and single-driver design, they create a soundstage that is completely free of the enclosures. While the ReTHMs high sensitivity lets them work well with really low power amps, it also ruthlessly exposes noise in the system. Most SET amps pay special attention to noise reduction, but some amps Ive evaluated have been way too noisy to work with the Second ReTHMs. Compared to the First Horns, the much more expensive Second ReTHMs are faster, more detailed, and have deeper bass (the first time Ive ever been able to make that claim in a review!). There is also a great difference is in their sensitivities: 102dB the Second ReTHMs and only 95dB for the First Horns. While 95dB is still much higher than average, the Second ReTHMs sensitivity let me use flea-powered amps like Wright WPA3.5s. In other words, the Second ReTHMs are superior in just about every way. But for over ten times the price of the First Horns, shouldnt they be? The Atelier First Horns have a lively, spunky sound that drew me into the music. Or, expressed in audiophile-speak, their dynamic range and agility, coupled with their accurate tonality and speed, were unusually effective at portraying musics expression and emotion. Their well-finished cabinets art deco look would fit comfortably into many décors, and their high sensitivity means you dont need to pair a super-power amp with them. Lets be realistic, however. There are many good-sounding speakers at the First Horns' highly competitive price point, and many of them have substantially more extended bass response, which will be important to many listeners. Fortunately, if you want more bass, the First Horns integrated quite well with an inexpensive subwoofer that fleshed out the lower frequencies very satisfactorily. Adding the $299 Infinity PS-8 sub to the First Horns resulted in a $998 speaker system that was terrific on a wide variety of music. Ultimately, what the First Horns give you is bargain-basement entry into the world of horns and single-driver speakers. They provide high sensitivity, excellent soundstaging, unusual coherence, freedom from crossover anomalies, and a special way with voices. If youre interested in hearing a horn speaker but dont want to make a large investment in it, you could do worse than make this speaker your first horn.